The U.S. housing market is on track for its best year since 2006. Home prices are up, foreclosures are down, boomerang buyers are re-entering the market, and millennials are finally—finally—moving out of their parents’ basements. Our long national nightmare appears to really be over. Bottom line: The housing crisis is beginning to feel like a distant memory. But don’t let that lull you into a false sense of security. If you’re buying a home for the first time—or even a second—you’ll need to remember all those things that the nation as a whole learned the hard way. Here are five financial lessons to keep in mind as you navigate the path to homeownership. 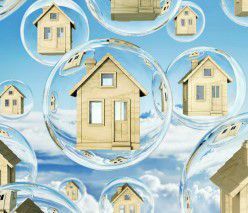 One of the biggest mistakes made by home buyers during the bubble was believing the value of their home would only go up, even in the short term. That rampant speculation and overborrowing burned millions of buyers when the bubble burst. Thinking of your home primarily as a place to live (rather than as an investment) means far less anxiety over the current price of the property. The longer you live in the property, the more likely you’ll be able to sell it for more than you paid—but that’s not always guaranteed. Most financial planners recommend that most homeowners have at least six months’ of expenses set aside in an easily accessible rainy day account. That fund gives you the ability to cover unexpected home costs like a broken air conditioner—or the mortgage payments if you lose your job, like many homeowners did during the recession. During the housing bubble, borrowers often financed their homes with risky mortgages that had ballooning payments, assuming that they’d be able to refinance before the mortgages reset. But then they couldn’t get approval for the refi because they had lost their job, or the value of their home’s price had fallen into negative equity. Today’s borrowers typically aren’t going for exotic mortgages. But you still might be tempted by the interest-only mortgages (which are just now beginning to resurface) or by the low payments offered by adjustable-rate mortgages. Just remember that rates are only adjusting in one direction: up. Just because a mortgage broker tells you that you qualify to purchase a home for a certain amount doesn’t mean you have to spend that much. Remember: the bigger the house, the bigger the costs associated with it, from taxes to lawn care. Lenders likely don’t know all of your financial priorities. Putting too much money into your home may crimp your ability to travel, put your kids through school, save for retirement—or even furnish that big, brand-new home you just bought! Don’t do it. “They never tell you that homeownership can be a real headache,” says Kyle Winkfield, managing partner at O’Dell, Winkfield, Roseman & Shipp, a retirement income planning firm in Rockville, MD. We know, we know—homeownership is the American dream. But that doesn’t mean that everyone should purchase a house. Remember: Homeownership comes with lots of responsibilities and surprise costs and taxes. There are plenty of smart reasons to remain a renter—from wanting the flexibility to easily relocate to enjoying the ability to pass off maintenance on that broken dishwasher to the super. But if you want something to finally call yours, we’re behind you 100%. Just be sure you can handle it.